You are currently browsing the archives for the tag 'fur scarf'. 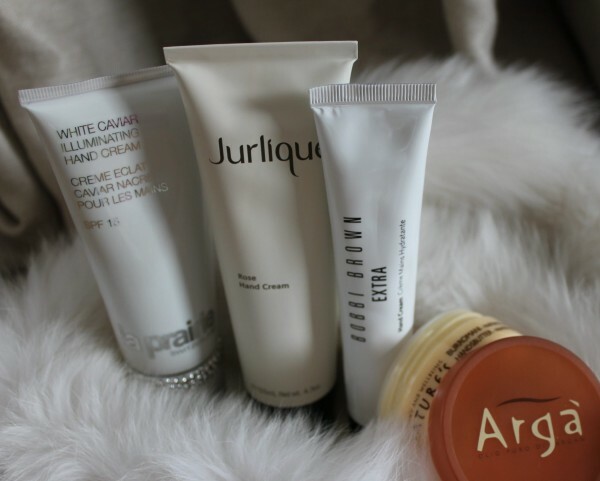 Avoid dry, flaky hands this winter with my favorite hand cream products that smell delicious and do wonders for cold-weather ravaged skin. Say hello to softer hands! This lightweight formula offers sun protection and anti-ageing benefits to help keep wrinkles at bay. It also contains powerful actives for brightening to minimize age spots. A rich protective hand cream with organic ingredients of rose, calendula and viola, to deeply moisturize and restore smoothness. For skin that is looking taut and gorgeous. A purse-friendly hand cream for on-the-go comfort that moisturizes and helps repair dryness instantly. Shea butter and clary sage combine to strengthen hands’ natural moisture barrier; glucosamine gently exfoliates while licorice extract helps lessen the appearance of discolorations. Boasting a range of natural ingredients, this ultra-rich nourishing product contains argan oil and shea butter to leave hands soft and moisturized. A perfect emergency product for sore, cracked hands. It is not greasy and leaves a pleasant citrus aroma.